New year, new you, as your local gym and purveyors of diet plans would like you to believe. And in an effort to show that we’re all in this together, here at TechRadar we’ve written up workout diaries as part of Fitness Week 2018. There are three different diaries, one for beginners, one that’s more intermediate (this one), and one for the fitness-obsessed. We've covered a range of different exercise types, and each of us has used tech appropriate to our level. For this diary, I used the Apple Watch 3. With the third iteration of its hugely successful wearable Apple has really pushed the fitness angle, improving on heart rate tracking and GPS from the Apple Watch 2. While not a dedicated fitness tracker, it's a device that many who are fitness enthusiasts will use for monitoring their progress which is why we decided it was ideal for the intermediate diary. Above you can watch our full review of the Apple Watch 3, or you can read the full diary below. If you're interested in one sport particular, we've included links here for you to get there quickly. Day 6) How did the week go? I’m an okay runner. I’d describe myself as competent but not confident. I can comfortably bash out a 5K, and if I really push myself I can manage a 10K – it requires a fair amount of mantra chanting and internal cajoling, but I can get there. I’d like to be able to run properly at a decent pace, but I’m very aware that whenever I run with one of my serious runner friends like (our running man of tech) Gareth they are humoring me with a run at a conversational pace, while I’m doing a proper run. In order to try and raise my game, I've started doing interval runs to raise my lactate threshold. The basic science is this: you have three different energy systems, one is aerobic (uses oxygen) and two are anaerobic (don’t use oxygen). The aerobic system is the one that allows you do endurance exercise, the others are for the more short, sharp burst sorts of exertions. While it’s easy to imagine these systems as clear cut, in reality there are transitions between the two, and the lactate threshold is basically the point between the aerobic system and the fist anaerobic where your body is creating more lactic acid than it can flush, causing you to tire, and slow down so your body can recoup its oxygen deficit and flush the lactic acid. If you don’t slow down, lactate production grows exponentially until you’ve got no option but stopping. Raise that threshold and you can run faster, and for longer. That’s the theory at least. There are a number of different ways to raise your lactate threshold but one of the most effective is by doing intervals. You do a period of exercise at a point above the threshold, and then a period below it, but where you’re still working so your body gets used to flushing while you’re still moving. For this fitness diary I’m using the Apple Watch 3, and for today’s training, I am using the imaginatively named app Intervals. Like many wearable apps, it’s a pared back version of the full mobile app, and you need to program your training routine on your iPhone before lacing up those running shoes and hitting the tarmac. Thankfully Intervals on the Apple Watch runs independently of the iPhone so you can – and I did – leave your phone behind when you’re out on your run. I decided I was going to do half an hour’s worth of 30 seconds on, 1:30 off with a five minute warm up to start (warming up’s important kids). Intervals shows you the amount of time you’ve got left of your current set, amount of sets you’ve got left, and importantly your heart rate. Lactate threshold usually sits between 75 and 85% of max heart rate, and for me is around 160bpm. So I was aiming for around 170 during my ‘on’ periods, and dropping down to around 145 for my recovery periods. 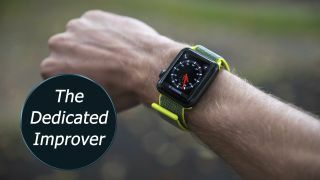 The Apple Watch notoriously has a pretty solid heart rate tracker, but it will still fall behind dedicated running devices like the Garmin Forerunner 935 that Gareth is using, and will be far less accurate than a chest strap like the Polar H10. That said, for what I was trying to achieve, it was more than enough. The combination of haptic and voice feedback to tell me when the end of each interval was approaching meant I never missed a transition, even towards the end of the training when I really started struggling. The screen on the Apple Watch was clear enough that I was able to see my progress with quick glances to my wrist, even during my more intense moments. The only niggle that I have is that Intervals doesn’t let you pull apart your data once you’ve finished your run like other dedicated running apps. I’d have liked to have seen how my pace and heart rate correlated across the training session, and how my end pace matched up to my starting pace. That said, I was very happy with how well the Apple Watch and Intervals managed to support me in my specific training goals, it meant that the only thing holding me back was my own willpower, which unfortunately there isn’t an app for. This is a day that I was really looking forward to, I am a big fan of high intensity interval training (HIIT). The basic principal of HIIT is training your body maximally, or just sub-max for short intervals followed by intervals of rest or very low-level active recovery. HIIT has gained massive popularity recently thanks to a number of studies that have shown you can get similar (and in some cases better) improvements in cardiovascular fitness and weight loss in short workouts than in long medium-intensity workouts like jogging or cycling. The way that this works is by raising your heart rate above 85 to 90% of max, working entirely anaerobically (without oxygen), causing your body to go into an oxygen deficit known as excessive post-exercise energy consumption (EPOC). With watchOS 4, Apple has introduced HIIT into the workouts that it can track in its native Workouts app, and it's a welcome addition, although is pretty featureless. It doesn't give you the option to set intervals before you start working, and doesn't have options for what type of activity you're doing. It's just a tap-and-go sort of arrangement. I decided I was going to do a Tabata workout of high knee sprinting on the spot. Tabata is a specific type of HIIT that uses 20 seconds on, 10 seconds off for eight rounds. If you're doing the maths and going 'that's only four minutes of working out' you're totally right. But done right, it's the most grueling four minutes of your life. Apple's HIIT function very quickly let itself down, as there's absolutely no way of looking at your watch to see how far into an interval you are while working maximally. I guessed the first three sets (fairly accurately) but I was frustrated by its inability to truly deliver a HIIT workout. I swapped over to Intervals, the app that I used for my running (mid-intensity interval) workout, and was able to plan a Tabata session that would provide the haptic and vocal guidance that I needed to start and stop at the right times. Having Intervals guiding me was brilliant in terms of adhering to the workout when I was using the full force of my brain to keep going (and not throw up), but I wasn't able to measure my heart rate to make sure that I was working in my maximal heart rate zone. The Apple Watch does have a disclaimer saying that because of the intense nature of HIIT it may not be able to monitor heart rate, and that's exactly what ended up happening. Obviously if the point of a workout type is about reaching a heart rate and you can't measure heart rate it's a but of a let down, but optical heart rate sensors are notoriously bad at measuring sudden dramatic changes in heart rate. Really I could have done with a dedicated chest band, which you can partner up with the Apple Watch. What the disclaimer adds is that it will still measure calories expended using the accelerometer, but this isn't exactly true. The reason that EPOC works so well is that it carries on burning calories after you finish exercising as your body redresses the oxygen deficit. Because of this you can be burning calories for many hours after a workout, so the 55 calories it said I burnt will be out by a country mile. So, all told, the Apple Watch was good at telling me when to stop and start again, but in terms of actually monitoring my output for HIIT, it wasn't much use at all. I love swimming, the feeling of weightlessness of being underwater has always appealed to me. When I was little I always used to jump in the deep end of swimming pools and try to spend as much time as possible floating there under the water, much to the dismay of my parents. I still love swimming, but often do a merman impression, swimming leisurely underwater. Even though I really love exercise I don't often just knock out lengths. Because of this, it was with slight trepidation that I approached this day of Fitness Week. That said, I’d read some very positive things about the Apple Watch 3 and swimming and so felt confident that the technology was going to support me, even if I did end up getting lapped in the pool by grannies in swim caps. The Apple Watch 3 does a pretty remarkable job of measuring exactly the amount of lengths you’ve done, and even makes a good guess at which stroke you’ve been doing. I did a variety of different strokes and it did a decent job of picking up the changes. It wasn't always right, but it made an educated guess and was right more often than it was wrong. I don’t know if this is just a symptom of my age, but it feels really wrong to get into water wearing an electronic device, especially one as expensive as the Apple Watch 3, but I needn't have worried. The Apple Watch 3 is water resistant not waterproof, meaning you shouldn’t take it scuba diving, or use it for anything that includes high pressure water like water skiing. For pool swimming it’s totally fine though. A cool feature of the Apple Watch 3 is that as soon as you start a swimming workout it locks the screen, and doesn’t unlock until you turn the crown on the side of the watch a few times. This unlocks the screen and flushes any water out of the Watch. I was using the Nike strap which was very comfortable underwater, but I did find a few times that it was slipping down my wrist. Obviously heart rate is going to be less accurate when underwater anyway so it would be possible to just wear it on the wrist rather than keep trying to get it into the ‘correct’ position above the wrist. It’s great that the Apple Watch has a dedicated section of its native fitness app that is dedicated to swimming. It makes it incredibly easy to start up, you don’t have to add any extra information about yourself, you just select ‘pool swim’, put in the length of the pool, and jump in (don’t cannonball, it’s frowned upon apparently). What’s testament to the Apple Watch is this is the first time that I’ve ever been able to connect my love of fitness with a love of swimming. I’ve always found swimming too tiring too quickly, and didn’t understand how to relate my knowledge of energy systems and exertion to swimming. Being able to stop at the end of a length, see how long it took me and get an estimate of my heart rate really helped me get to a stage where I was able to find a comfortable pace. I only did a pulse measurement once but it was off by 20 bpm, like I said, not surprising when you’ve got water between an optical heart rate sensor and your skin but still, it’s best not to treat it as an estimate rather than a fact. I managed to push through the ‘swimming is really hard’ barrier that has always taken me down in the past, and I think a great deal of that is thanks to the Apple Watch. I would definitely use it again. One of my greatest regrets living in London is that I don’t get a chance to get out on a bike as often as I’d like. I used to cycle absolutely everywhere, and then a series of events that included my bike getting stolen and some of my friends having hairy moments on the roads meant that I hadn’t been on two wheels in a while. Luckily there’s a saying about never forgetting an old skill, and it was very much true for today’s fitness diary entry. I’d been pretty excited about getting back on two wheels, and experiencing the exhilaration of finding a smooth even pace, the wind rushing over you, was a real joy. I decided that I was going to use Strava’s running and cycling app as I’d read very good things about it, and I wasn’t disappointed. Like many of the apps that I’ve been using over the course of Fitness Week, it works without your phone being near, which was a real worry with cycling, as I’m not a massive fan of arm straps for phones, and would worry about my phone falling out of a pocket. Seeing as fitness devices usually piggyback off the GPS of the phone that they are connected to, it was something of a concern when I opened up the Strava app on the Apple Watch and it didn’t have any indication of whether it had a GPS signal, it just had a big red ‘Start’ button. But I needn’t have worried, the GPS tracking of my cycle was totally accurate, and meant that mid-cycle it was able to give me accurate readings of how far I had cycled, and also my pace, so if I was preparing for a race and wanted to train maintaining a certain pace, I would be able to do that. But for me, even though it all came flooding back I could feel that I was working muscles that I hadn’t flexed to their fullest in a while so held back from really pushing myself as I didn’t fancy having to write about injuring myself as part of my fitness diary. I have always been quite an instinctive cycler, and so it was fascinating for me to see the way that effort affected my heart rate, and I learnt that when I felt like I was really exerting myself, I wasn’t actually in as high a heart rate as I thought, and just knowing that made the task less difficult. It’s one of the interesting things about really utilizing the data from trackers, that it’s easier to break down psychological barriers when faced with data telling you that you’re not actually working that hard. And the data is really where the Strava app came into its own. The Watch screen was fairly simple, with just heart rate, the time, duration of exercise, and speed shown. The real insights come once the ride is over and you open up the app on the iPhone. As with all of the Apple Watch apps that I’ve been using, the sync is totally seamless, instantly transferring over to the phone. Strava’s app allows you to really pull apart how your cycle went, with graphs showing the elevation, your speed, your heart rate, and the amount of time spent in each heart rate zone. You’re even given a ‘suffer score’ that is a reflection of how much time you spent in the higher heart rate zones. Some of these more advanced features require a subscription to Strava, but the app is totally free, and I think if you’re really into the data the subscription is worth it. Overall I was very impressed with the Apple Watch and the Strava app with my cycle, and I think that for a mid to high-level cycling enthusiast, it would more than suit your needs. A really nice touch is that it has awards that are not just distance based, but actually tied in to specific locations so you get awards for things like ‘Hyde Park, the fast bit’. If anything, this experience has made me want to get back into cycling, which is probably the biggest compliment I could pay it. This is the day I was most excited about. I’m a qualified personal trainer, and of all of the exercise disciplines we were coving this week, gym work is the one I felt most at home with. I really love the feeling that comes from pushing your body to achieve something that it can’t currently do. While the free weight section of a gym can be a fairly inhospitable place, full of protein-obsessed meatheads all trying to outdo each other, I find the practice of repeated effort ending in a mind-over-muscle challenge almost meditative. Unfortunately, the Apple Watch was not totally there with me on this journey. More than on any day so far the Apple Watch was disappointingly lacking. It doesn’t have a weight training section of its fitness suite, and the third-party apps that I found were all pretty underwhelming. What really surprised me was the complete lack of tracking for type of movement. When I was reviewing the (considerably cheaper) Android Wear-toting Ticwatch S recently, it had a workout tracker that used the onboard gyroscope and accelerometer to measure the number of reps I was doing, and even made educated guesses as to what exercise I was doing. Given that the Apple Watch was able to guess at the swimming strokes I was doing earlier in the week it really surprised me that it didn’t have any feature akin to the one offered by the Ticwatch S.
What this meant is that I ended up using an app called Gymaholic that basically just led you through a workout. Because it doesn't have the ability to track motion, it isn't able to identify how far you are through each set, so can't offer any kind of encouragement, and won't start your rest period automatically when you finish your set. It becomes a little more valuable after the workout, when you can look at the parts of your body that you've worked, your heart rate zone and estimated calories expended during exercise. As muscular contraction warps optical heart rate sensor readings, I took the readings for anything that involved gripping with my right hand with a pinch of salt. Gymaholic will help you to make sure you're not neglecting parts of your body (I'm looking at you, person that hasn't done legs in a year), but in terms of helping you mid-workout, the Apple Watch simply isn't built for this use-case. It was able to handle the warm-up that I did on the static bike, and there are a number of pieces of kit that are starting to appear in gyms that you can tap the Apple Watch on to get more accurate data, but these are all the cardio machines, not the resistance ones. The truth is, for the main body of the gym session I’d have been better off without the Watch. If you’re a gym bunny, I’m not sure that there is a tracker out there at the moment that is actually brilliant for your needs, but the Apple Watch certainly isn’t it. After spending a week’s worth of different exercises with the Apple Watch 3, I can safely say that the Apple Watch is brilliant for traditional endurance cardio. I was very impressed with how it complimented my running workout, and likewise with swimming and cycling. When it came to the gym session and the HIIT training, it was effectively reduced to being a very expensive stopwatch (which is sill a very useful piece of kit to have in these scenarios). Given that the Moov Now that James was using during his week, which is much cheaper and more basic device than the Apple Watch was able to monitor cadence and movement type, it is a little disappointing that the Apple watch doesn’t have this functionality. What is impressive is how well a device that isn’t primarily a fitness device caters for serious fitness goals. From my time with it, I can easily imagine that you could train for a triathlon with the Apple Watch. It may not be quite advanced enough to pull apart information for those that are on the verge of professional, but for the fitness enthusiast, I think it would more than meet your needs. Another thing that’s worth noting is that the Apple Watch 3 comes in an LTE version that means you can take phone calls while out on your run, and stream music while out on your run. The battery life is impressive enough that it could handle longer runs, and from our battery tests, it should be able to cater for the type of runner who completes a marathon in five hours. I enjoyed using the Apple Watch, and would happily recommend it to anyone who is looking for a smartwatch that can also help you improve your fitness. If you’re more bothered about fitness and not so bothered about the smartwatch side of it, you could do better for the money, and if you’re looking for something to help in the gym, this isn’t it. That said, Apple does have a knack for making slick, easy to use devices and the Apple Watch 3 is no different. It was easy to figure out, and a genuine pleasure to use.